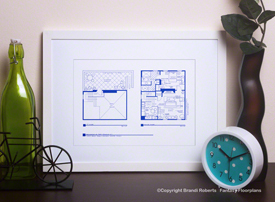 Buy a poster of Tom Magnum's guest house floor plan from Magnum P.I.! 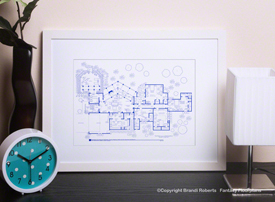 › View Floorplans by Decade › 1980s TV Show Floorplans › Fantasy Floorplan™ for Magnum P.I./Hawaii Residence of Thomas Magnum, P.I. Welcome to my fictional Magnum P.I. 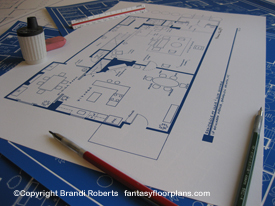 guest house floor plan, which belongs to elusive writer Robin Masters. Robin lets Tom Magnum live here in exchange for his detective services. This guest house features two levels -- the terrace and the downstairs living area. The terrace offers sweeping views of the estate and ocean. Downstairs you'll find a kitchen overlooking the living area. In the kitchen, you'll find Thomas' favorite beer -- Coops. On the living room table you'll find the keys to the Ferarri (it's a 308GTS) and his lock-picking tools. Making our way into his bedroom, we find his baseball cap on the bed post, colt hand-gun and rolex on the chest and binoculars on top of the armoire. The spacious bathroom features a walk-in shower and soaking tub. My Magnum P.I. 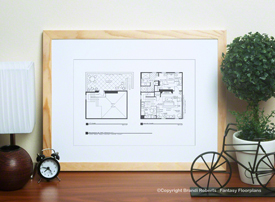 guest house floor plan is sure to entertain and delight anyone who loves the show!